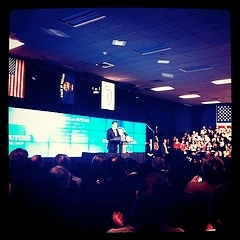 President Obama is visiting Intel in Hillsboro, Oregon today to discuss education and technology. And I flashed my education technology blogger badge and landed a media pass to his press conference. Education has been the key theme as the President has travelled the country this week, following the release of his 2012 budget on Monday -- announced at a middle school in Baltimore no less. Obama seems to have made education a central part of his agenda recently, featuring it in his State of the Union address and now in this proposed budget. The budget calls for a $2 billion increase in education spending -- $77.4 billion total. Of course, it's not all good news. The increase belies the details of what's funded and what's cut. But I'm not a policy wonk, so I'll let you read elsewhere about the details of the President's proposal. I'm here at Intel today because Obama is set to speak about innovation, education and technology. I hope to hear more about his proposal for ARPA-ED, a new education technology initiative modeled on DARPA -- the military agency that gave us the Internet. (I can't begin to tell you how conflicted I am about this. Oh wait, yes I can. I wrote about it in The Huffington Post). Obama will likely announce that Intel CEO Paul Otellini has been named to the President's Council on Jobs and Competitiveness. And he is scheduled to tour this plant here -- site of a major chip manufacturing project and something, along with Intel's STEM education efforts, that highlights the importance of a high-tech workforce. 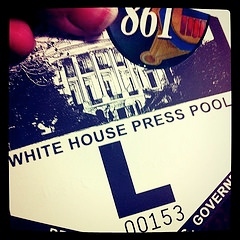 I'm going to try my damnedest to liveblog this thing, should Presidential protocol allow. You can also watch the President's speech live, beginning around 11:30 PST at http://www.whitehouse.gov/live. 11:17 AM: The President is touring the chip plant here. Me, I'm testing the food in the press room. Most folks are seated quietly in the audience (Oregonians are so polite). The President is due to speak in about 12 minutes. 11:22 AM: Music paused. Crowd got quiet. False alarm... just someone adding the Presidential Seal to the podium. 11:36 AM: We should be starting soon as the travel press have arrived, along with a large group of students. 11:42 AM: The "silence your digital devices" announcement. 11:44 AM: Paul Otellini, Intel CEO, takes the stage, welcoming Oregon Governor Kitzhaber. Otellini says he's excited to celebrate "American innovation and American manufacturing." 11:45 AM: Otellini says that we need to "re-ignite innovation" in order to create jobs. He's describing Intel's new semiconductor plant. Pause for Intel D1X infomercial -- "a vital addition" to the Intel plant that will create 3000 construction jobs just to build. When finished, it will have a cleanroom as big as four football fields, open for manufacturing in 2014 -- the largest microprocessor manufacturing plant in the world. 11:48 AM: "I'm pleased that the President and his administration have taken a number of steps to invest in education." Building the future requires more than investment in manufacturing. Otellini is touting the educational background of Intel employees, and says the company fears the shortfall of those trained in math and science to meet Intel's needs. 11:50 AM: Otellini touting the $1 billion that Intel has invested in STEM education programs. "We view these efforts as vital investments in the next thinkers and entrepreneurs." 11:51 AM: Otellini is emphasizing Intel's commitment to keep manufacturing and technology jobs here in this country. 11:54 AM: "It's like magic," says one of the President's staff, following the tour of the plant. 11:54 AM: Most impressed with the students' science projects. "Gave me a chance to nod my head and pretend like I understood." "And that was the high school kids." 11:55 AM: Now he's describing two 7th grade girls' projects with LEGOs (Mindstorm). The President said he was a fan of building LEGO towers as a kid, so he thought these projects would be more his speed. But he says that programmable LEGO robots, well, "I guess that's different than towers". 11:57 AM: "Intel has placed its bets on America." "One obligation is to its shareholders. The other is to America." The question, says the President, is how we maintain this climate. How can we make sure businesses stay here, hire here? 12:00 PM: As we strive to make sure we have a good climate for businesses -- with tax and regulation cuts, "we cannot sacrifice our future." "We have to out-education and out-hustle the rest of the world." 12:01 PM: Finally, he gets to education... In the next few years, jobs will require more than a high school education. "As many as a quarter of our students aren't even finishing high school. The quality of our math and science education lags behind many other nations." 12:04 PM: "We focused a lot on teachers. We want to make teaching an honored profession in our society." Wants to hire 100,000 new teachers. Wants to make permanent tuition tax credits. "We want to revitalize America's community colleges." 12:07 PM: "Change the Equation" -- boosting math and science education, a program that Intel participates in. Intel as a corporation that understands the importance of investing in education. 12:08 PM: Obligatory Beaver shout-out. (The President's brother-in-law is the basketball coach at OSU). But then the President related the story fo Nabil Mistkawi, an Intel employee who was able to complete his graduate work in CS at Portland State University while keeping his Intel job -- and then contribute a major breakthrough for Intel in the creation of their smaller chips. 12:10 PM: "America will win the future." "When it comes to competing for jobs, we're all on the same team -- the American team." And now Obama is working the crowd, with the ritual handshaking. Me, I'm going to try to nab some of the Intel Education folks, and see if I can talk to a girl that's impressed the President with her LEGO building skills.